I’m only a couple of weeks now from having son number 2, so I’m kicking up my feet a little more these days. One of my favorite things is to listen to podcasts (okay, and watch DVDs of Mad Men). In the NY Times Book Review podcast, I lucked upon an interview with science writer and mom Annie Murphy Paul. 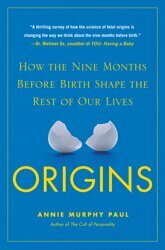 She was discussing her new book Origins: How the nine months before birth shape the rest of our lives. When the discussion first started, I had some trepidation about where it might go. I remember a Los Angeles Times health article a couple of years ago that painted a really bad, moms-walking-on-eggshells-because-of-new-possible-research picture (and, actually, egg shells is probably a bad example because I’m sure some preg mom wouldn’t do that for fear of salmonella). 1.She ate more fish (but didn’t overdo it with the high mercury content variety). Click here for a link to the Annie Murphy Paul interview.